Fifty-two percent of Fortune 500 companies from the year 2000 are now extinct, and 80 percent of all start-ups will fail within their first 18 months. Yet there’s a lack of urgency to address this callous reality across the board in most organizations. And the solution can be unlocked with courage. Return on Courage (ROC) is the go-to courage instructional manual that helps readers attack and shrink business fears head-on. They will learn how to relentlessly play offense, drive change, and transform into a Courage Brand®. ROC can be the secret weapon to innovating new products and services, maximizing ROI, and revolutionizing their industry. "The difference between mediocrity and greatness or failure and success is one simple ingredient: courage. Finding the courage to be different, taking risks, or challenging the status quo are typically our biggest obstacles at work and in life. Thankfully, Ryan provides a playbook to find our inner courage and realize our true potential. 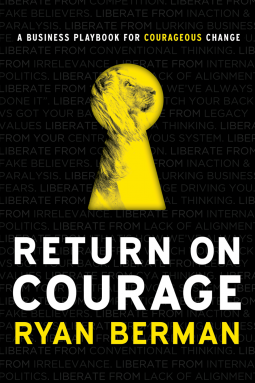 "Return on Courage is a timely, relevant book that provides the instruction manual for business survival in these turbulent, courage-deficient times." "Return on Courage is not only the rally cry that businesses need to stay relevant in today's rapidly changing environment, but it also provides a road map that leads to action." "Ryan nails it in Return on Courage. At a time when many brads are struggling to find their inner courage, this book provides the answer." If courage is the accelerator , then risk is the brake pedal - this is a great metaphor and this is what the book is about. It is full of business examples and experiences shared. I think the book is a very good motivation for anyone from a corporate environment to a start up world. Indeed it is important to have more courage to build your own business, to establish and grow a brand or to recover an existing and running business from a down time. I like this quote: " Courage is for your direct manager who may be suffering from symptoms of indecisiveness. " You are your own manager and internal courage is your personal coach, mentor, motivator and manager. I would recommend this book for anyone looking for motivation to get back on track or to start own journey in the world of business. I love this book! It's easy to read, practical .. "The true value of a goal lies entirely in the person you must become to achieve it." This really resonated with me. A goal setting book with a difference. It's not all about motivation - it's about changing the energy of who you are to attract the energy of what you want.